Today we took the train into town with a singular mission: to hunt down the giant rubber duck. And we were not disappointed. My girls both squealed with delight as we rounded the corner at Darling Harbour and this gorgeous yellow rubber ducky came into view. The duck is a five-stories-high and five-stories-wide installation by artist Florentijn Hofman (The Netherlands) as part of the Sydney Festival 2013 here in Sydney, and well worth the trip. I bet the ice cream shop directly in front of the ducky is pretty happy about it too. Along with everyone else, we grabbed a cup of lychee and chocolate gelato to devour while we sat and contemplated the duck. As you do. The rubber duck is on display until 23rd January 2013. Catch a train or bus to Town Hall and walk directly down to Darling Harbour. Find out more about the Sydney Festival 2013 on the website. I just caught up with your blog when looking for things to entertain the kids when we visit Sydney in January. 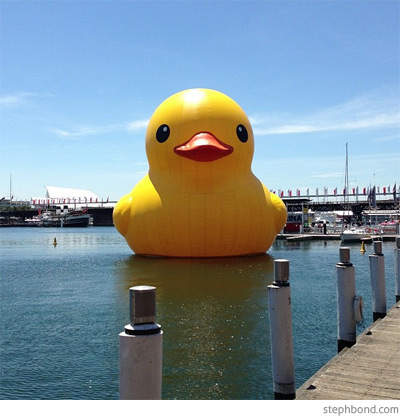 So disappointed to hear we are a year late, but I’ll check out the website link to the festival anyway to see if the duck will be making another appearance in 2014.